If necessary, select Sheet for the Source setting. Select the Quality Option setting that matches your print content and the print quality you want to use. Select the type of paper you loaded as the Type setting. Select the size of the paper you loaded as the Size setting. Note: You can also select the User Defined setting to create a custom paper size. If you are printing a borderless photo, select Borderless. If you are printing a document or a photo with borders, select Borders. 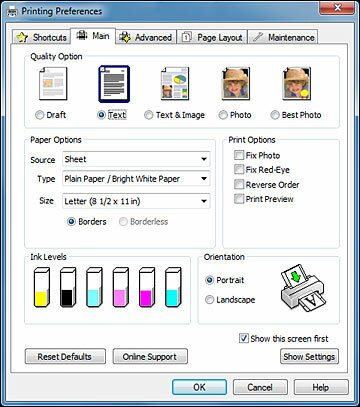 Select the orientation of your document or photo as shown in the printer settings window. Note: If you need to access the Epson product support website, click the Online Support button.